Hans had a problem charging his new UV-82 battery. He took apart the charger and thinks he found the problem. I think if he looks more closely at the battery, he will see he just wasn't patient enough. Really surprised that Radio-Mart hasn't already announced their "exclusive" availability of the new Baofeng 280,000 mAh battery. Their video commercial (posted on YouTube) still incorrectly claims the UV-82 ships with a 2800 mAh battery, which is also incorrect. I just took delivery of my Baofeng UV-82L 2 days ago. 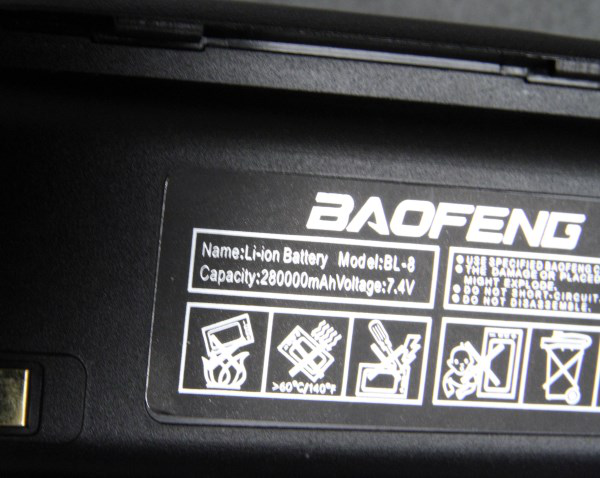 I checked the battery and it has a sticker identifying it as model BL-5, capacity: 3000 mAh. Do you know about these or is a "miss-print" too? It's probably not a miss-print, but a scam. Only 1800mAh batteries have been made.